The index opened gap-up around 8585 but saw profit booking from higher levels to end the day nears the lows at 8538.30, loss of 26.10 points. The broader market was also weak, with 691 advances to 853 declines. 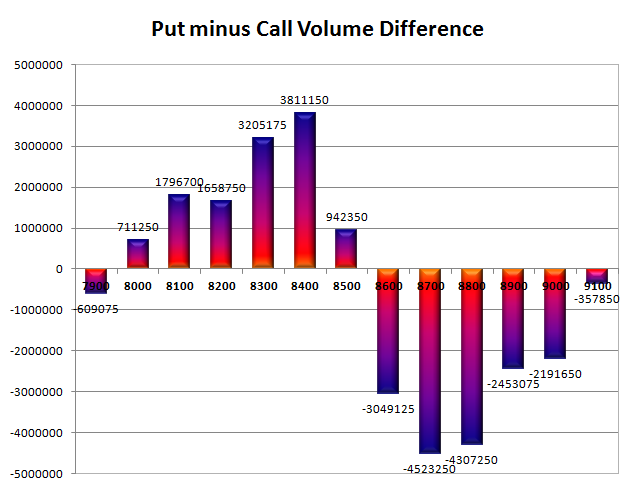 Range for Nifty as per OI Table comes to 8400-8700. Call option 8600, 8800 added 1.09 lacs OI with profit booking seen at 8700 and above strike prices. Put option 8400-8300, 8100-8000 added huge 6.11 lacs OI with short covering seen at 8600 and above strike prices. 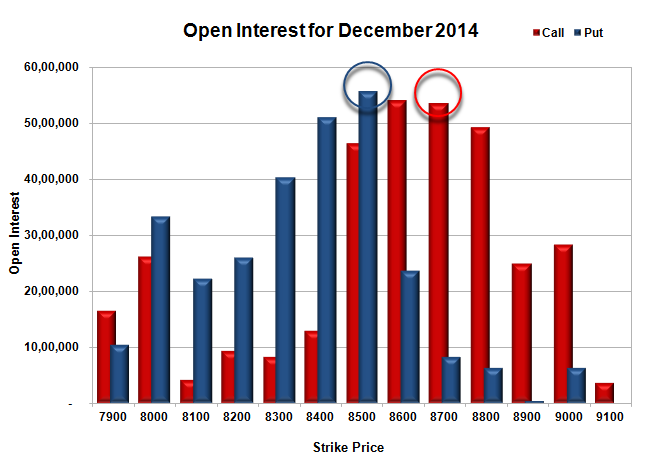 Nifty Open Interest is at 2,01,40,825 up by 2,43,250, with decrease in price, probably small short build-up. 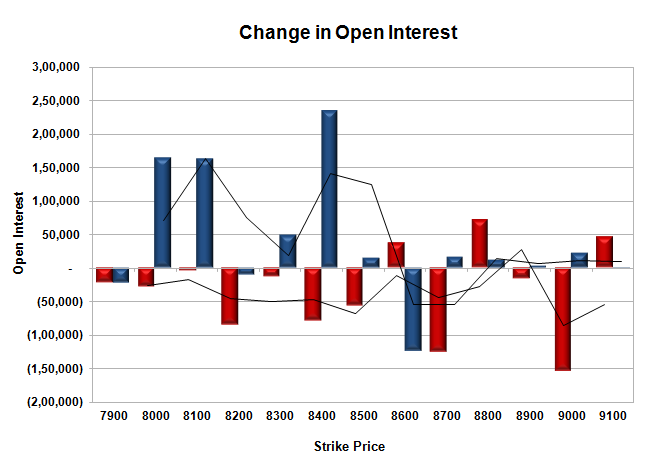 Bank Nifty Open Interest is at 19,00,900 up by 22,425, with decrease in price, probably short build-up. FII’s bought 3.04 lacs Futures, which includes 13744 contracts long build-up and 1565 contracts short build-up, with increase in net OI by 15309 contracts (includes 36395 longs to 24216 shorts for the day) and the Average Price comes to 8808.30. FII’s Index future open contract as on date is 619603 Longs to 76885 Shorts, net long 542718 up by 12179 contracts. Initial and best support still at 8500, with highest OI of 55.76 lacs and below that at 8400 with OI of 51.13 lacs. Initial resistance at 8600, with OI of 54.13 lacs and above that at 8700 with OI of 53.60 lacs. Day Range as per Option Table is 8492 - 8602 and as per VIX is 8485 - 8592 with 8550 as the Pivot.